Yes! It doesn’t get better than 10,000 sqft of sheer trampoline space, thanks to Play Factory. So much room to go crazy and just jump and even burn those calories. We are already feeling less stressed with life! 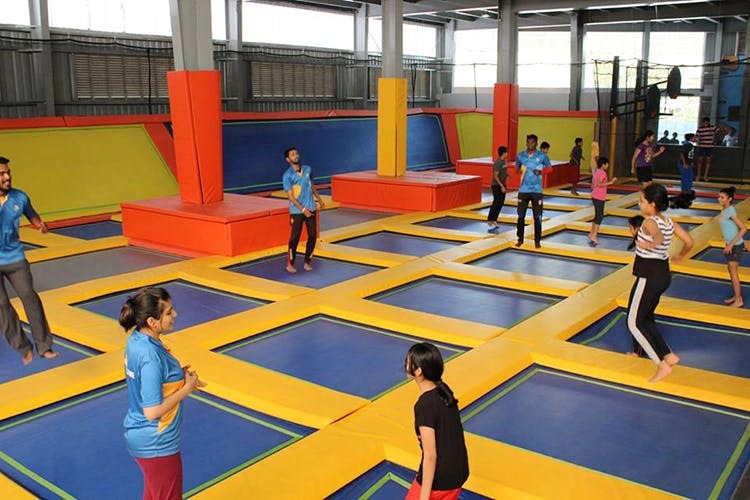 Touted to be the second largest trampoline park in Asia, and India’s first and biggest (or so they say! ), Play Factory, is officially our favourite place to let loose and go nuts. With an entire indoor arena dedicated to trampolines, you’ve gotta try this out. With soft padding diving up the whole space, you can jump to your heart’s content without worrying about bumping into someone else. And the best part is that you’ll even burn calories. According to NASA (yes, we’re geeky like that), you’ll lose a similar amount of calories in 10 minutes of trampoline bouncing as you would in a half-hour run. How’s that for a fun workout! True to its name though, there’s more fun on offer. When you’re done at the trampolines, hit up the foam pit. Filled with foam cubes to break your fall, this one’s great for aerial tricks. Similar to the trampolines, you can flip, jump and bounce here too. In fact, if you’re trying to get into the cool sport of parkour, this is the place to start. A trampoline side means you can even pull some Jackie Chan moves off it, even if not as graceful. But hey, we tried and it’s fun. Make sure someone is taking photos as it’s great to laugh over later! When you’re settled enough from all the adrenaline, there’s indoor cricket and football to try out too. Plus, some beach volleyball and soccer with actual sand. Practice now and you could be representing India at the next Olympics. There’s two restaurants, called 3rd Innings and Tiki Taka, where you can load up on food and cocktails — great to catch up with friends while also watching live sports on the big screen.